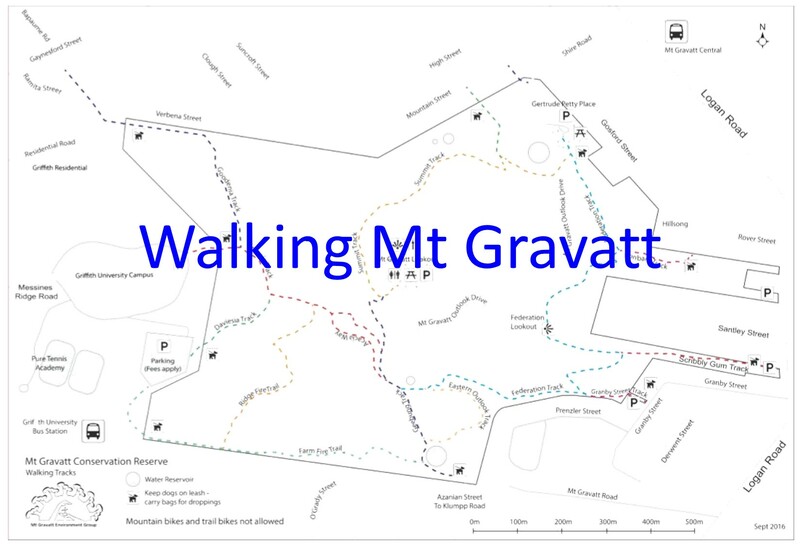 Winter is a great time to walk in the bush in Mt Gravatt Conservation Reserve. Misty mornings, bright sunny days and no summer heat. The light in winter is special – softer. 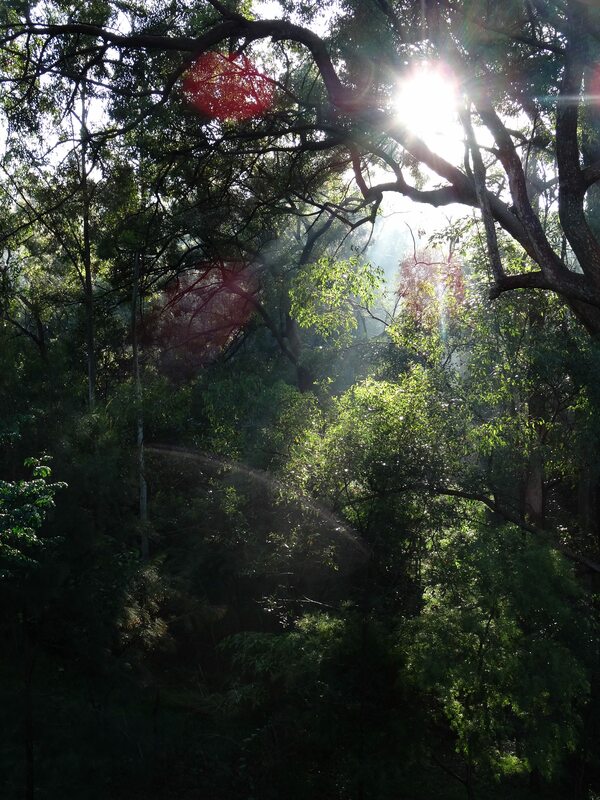 Winter light helps you see and photograph the bush in different ways. Explore the mountain tracks and discover the winter flowers. Early Black Wattle Acacia leiocalyx is just past its best. Also called Lamb’s Tail Wattle, it is a key food supply for caterpillars of Imperial Hairstreak butterflies – Jalmenus evagoras. Look for the caterpillars around February-March. 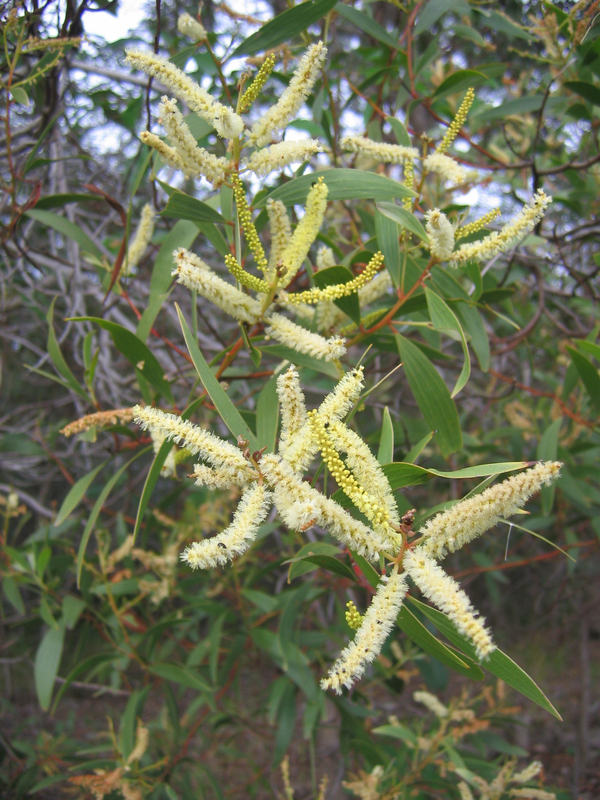 Learn to identify Early Black Wattle with the winter flowers so you can find the trees in summer. The red colour and triangular shape of the stems are key identifiers. Brisbane Fringed Wattle Acacia fimbriata is now coming into flower. With its bright yellow ball shaped flowers this is one of the most attractive trees in the forest. 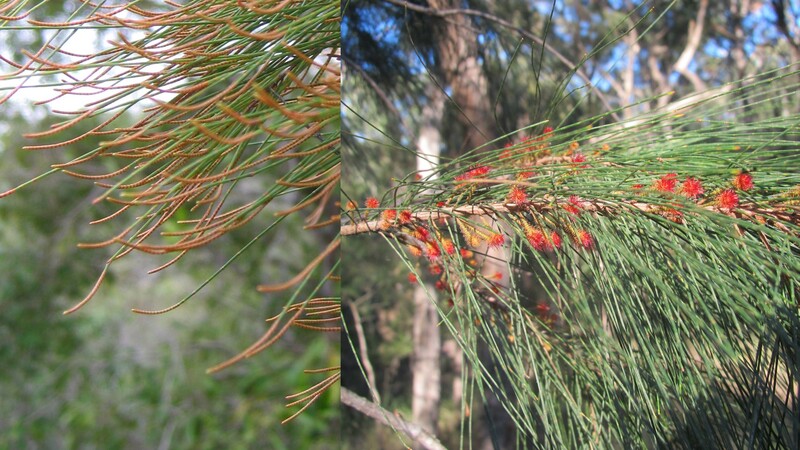 Once the Acacia fimbriata produces seeds it is very popular with the spectacular King Parrots Alisterus scapularis. Blackthorn Bursaria spinosa flowers all year. 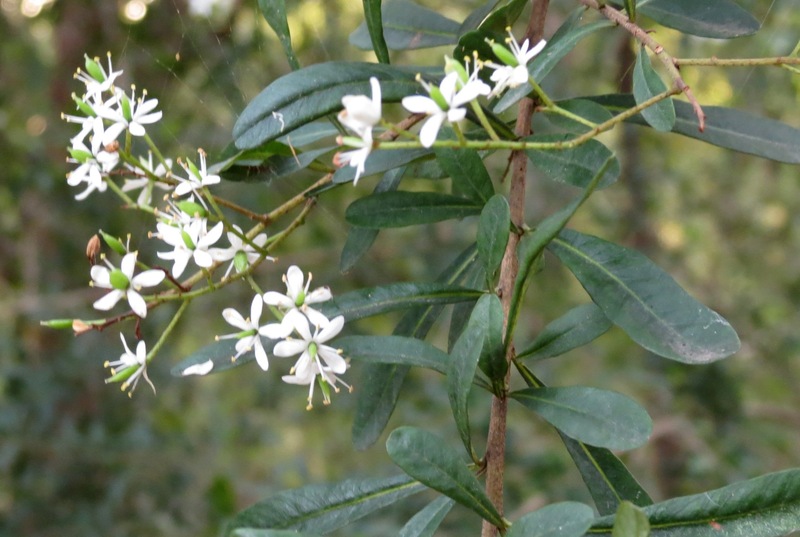 As the name suggests Blackthorn, with its spiky habit, is useful for Security Planting keeping people out of bushland areas and protecting small forest birds from larger more aggressive birds. 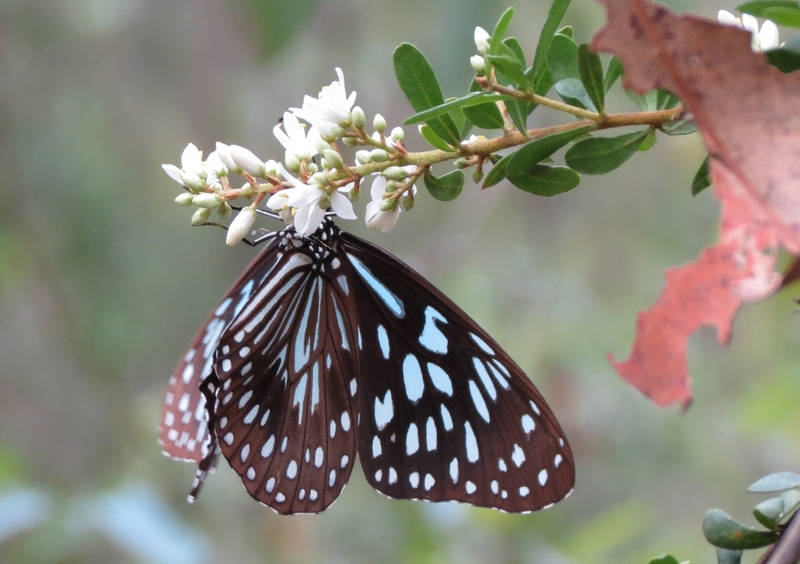 Blackthorn nectar is also popular with butterflies like the Blue Tiger Tirumala hamata. Black She-oak Allocasuarina littoralis is one of the most interesting trees flowering at the moment. In March the male Black She-oaks started producing their flowers showing up as the russet brown tips with the trees glowing in direct winter sunlight. Female Black She-oaks only started to produce their distinctive red flowers in June. Blue Tiger butterfly caterpillars feed on only three plant species, none of which are found in the Reserve. Reference: Butterfly host plants of south-east Queensland and northern New South Wales (2013) – Moss, J. T.
Fortunately the adult Blue Tigers are less choosy, visiting the Reserve to feed on nectar of the Blackthorn Bursaria spinosa. Watch carefully to see the butterfly’s proboscis flicking in and out the reach the nectar deep in the flower. Imperial Hairstreak Jalmenus evagoras butterflies are breeding in the Reserve with caterpillars feeding on Early Black Wattle Acacia leiocalyx. 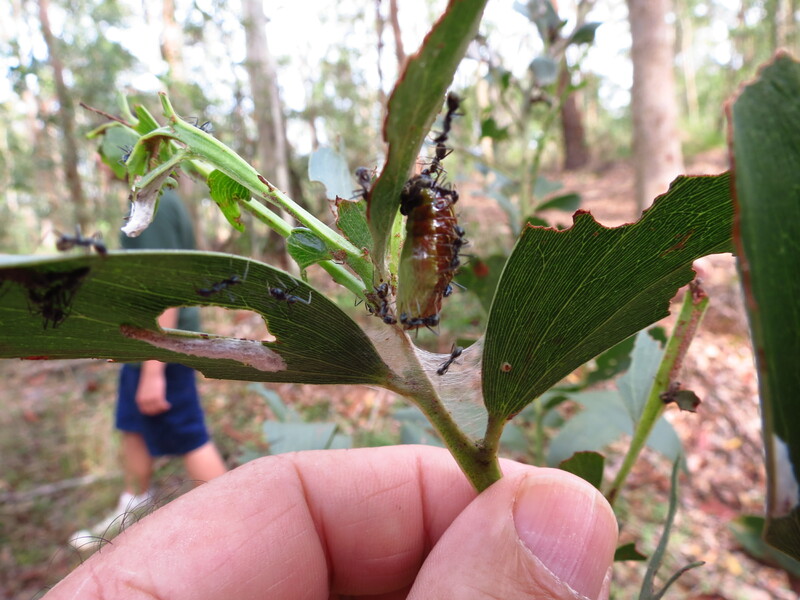 Imperial Hairstreak caterpillar and chrysalis also depend on attendant “Kropotkin” ants – Small Meat Ant Ants Iridomyrmex sp. which provide protection in return for sugary fluids secreted by caterpillar. Click on photo to enlarge. 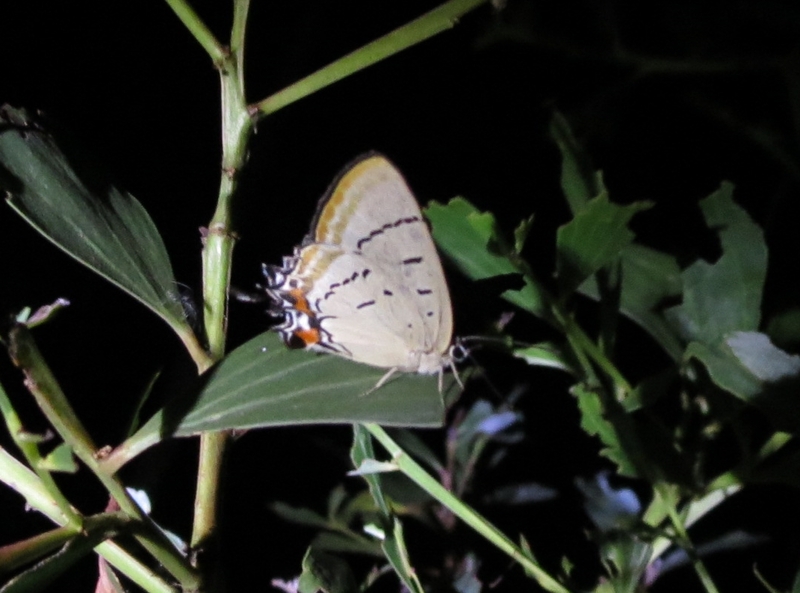 Last night I learned something new about Imperial Hairstreak butterflies, they roost at night on their caterpillar food trees. At great time to get a close up photo as they slow moving in the cool night air. 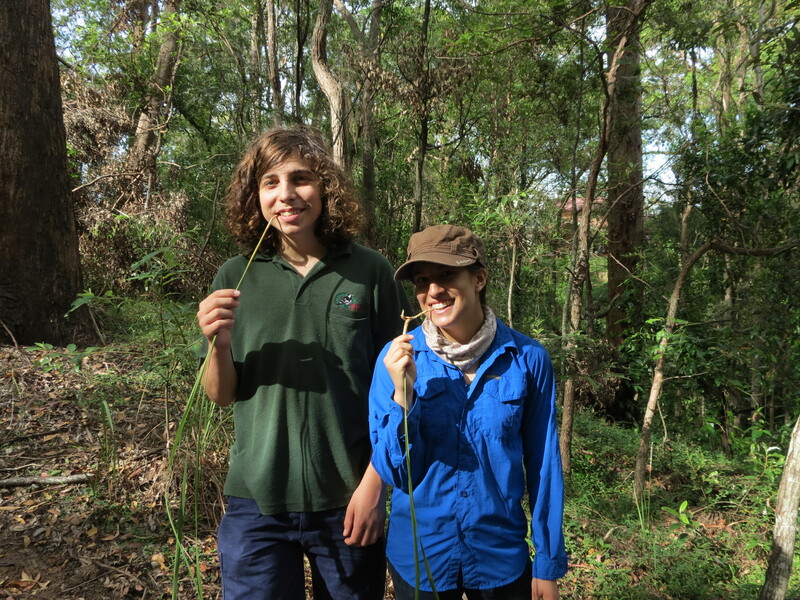 I was helping Helen Schwencke – Earthling Enterprises, as she collected Acacia leaves for the Hairstreak butterflies she is raising for her life-cycle research. We were both surprised to find the adult butterflies roosting on the same trees. 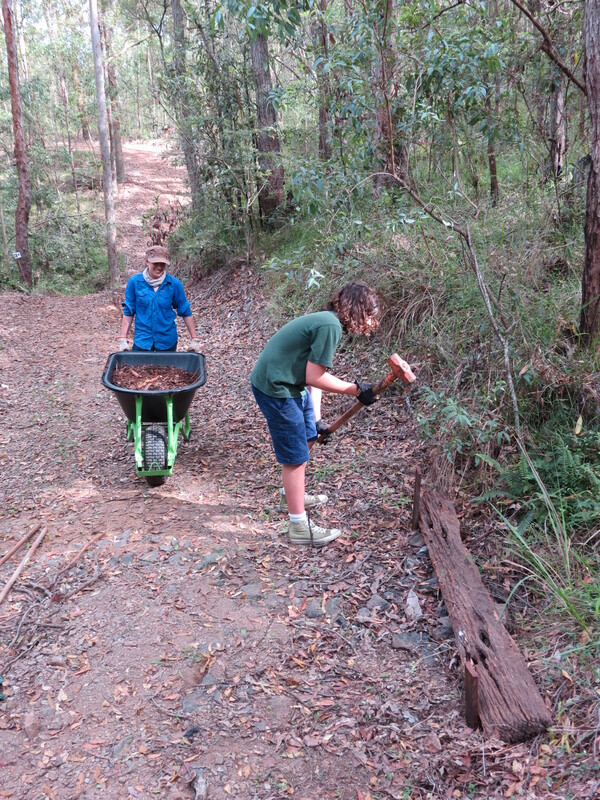 We welcomed the Griffith Uni Bushcare Team back to Fox Gully on the Saturday before Easter. 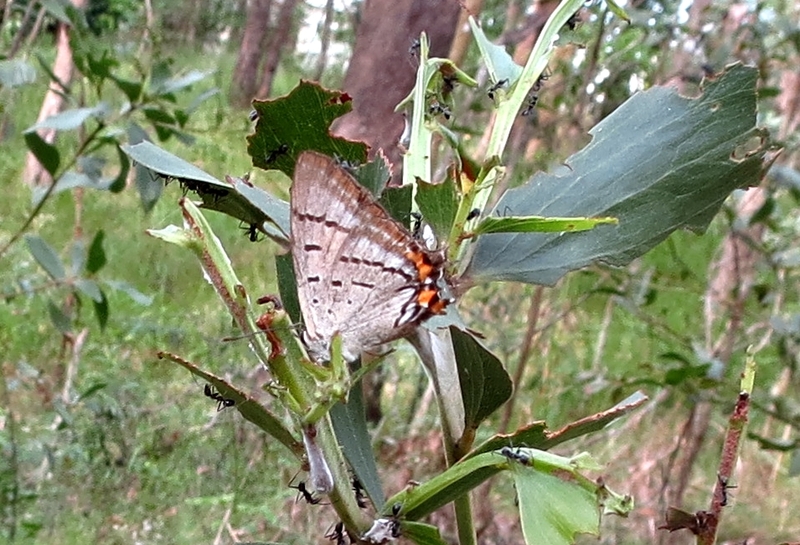 Mind you, it took a while to get them onsite as we found some Imperial Hairstreak butterflies, Jalmenus evagoras, beside the track. It is always a pleasure to find someone else who can be totally fascinated by a few of butterflies, caterpillars and ants. 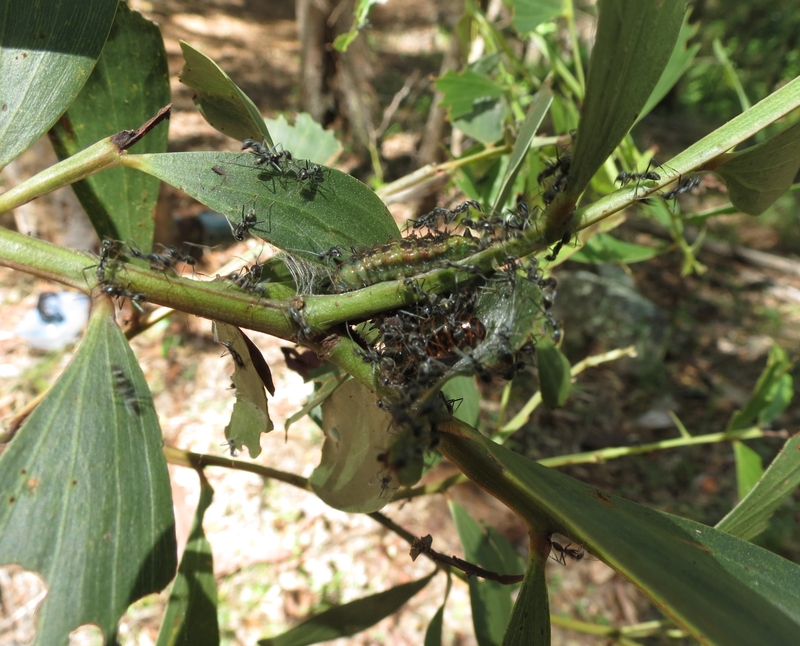 Imperial Hairstreak butterfly caterpillars and chrysalis are protected by native Small Meat Ants Iridomyrmex sp. referred to as Kropotkin ants. Read my article in Southside Community News. 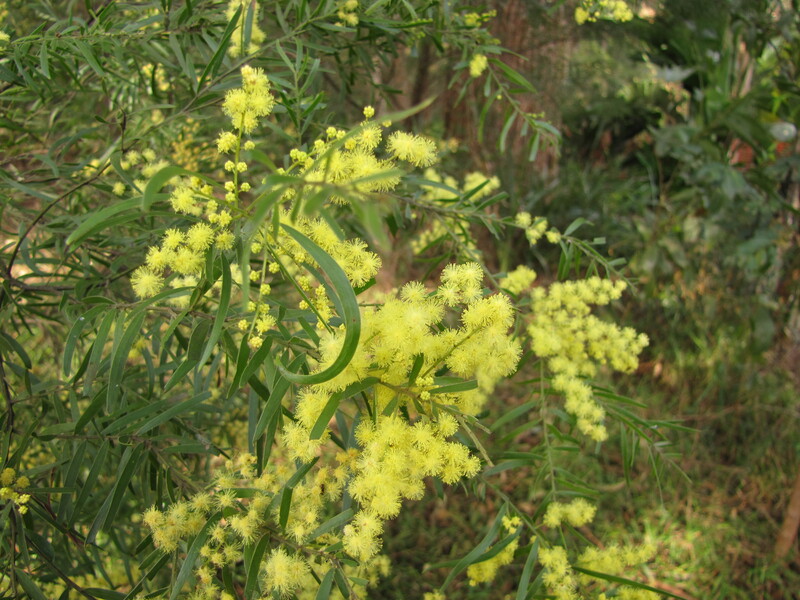 The Early Black Wattle Acacia leiocalyx are interesting with their distinctive triangular stems. The main project for the day was restoration and improvement of the “mulch filters” that keep silt from the dirt maintenance road flowing into the gully. The filters have proved very effective in reducing erosion and keeping the water in the gully clean. The mulch filter is designed to slow the water flow at key runoff points on the track, allowing the silt to settle out. Silt is already 100mm deep behind one filters and starting to support natural regeneration of native grass. The original filters were made by simply mounding mulch at the runoff points as an experiment. Now that the effectiveness has been established logs are being installed to make the filters more permanent and allow mulch to be piled higher. Of course after all the hard work a snack is in order. 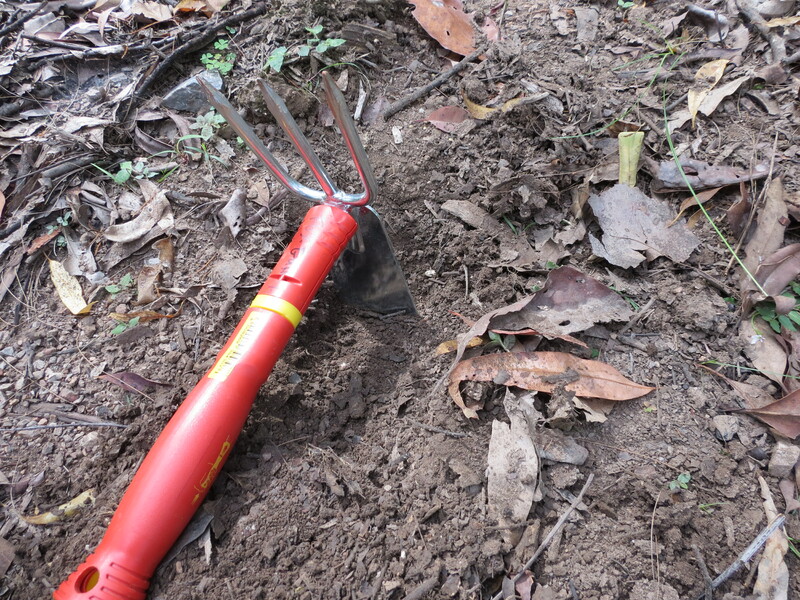 Mirandha try out the sweet roots of Blady Grass Imperata cylindrica.